Seat's '08-plate offers | What Car? 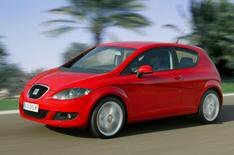 Seat has launched several offers to tempt buyers into the showroom in time for the '08 numberplate change in March. Theres a 0% finance deal over three years with a 30% deposit on all Ibiza models, bar the new environmentally friendly Ecomotive version. Remember, though, that the refreshed Ibiza is out this summer, so this finance deal shouldn't prevent you from haggling hard on these run-out models. Selected Altea and Altea XL models have had 1500 cut from the list price, while there is up to 2000 off the Toledo. Theres also 1000-worth of freebies with the Alhambra MPV, which includes 750 of Center Parcs vouchers and two free integrated child seats.